The single-line ShoreTel IP Phone 115 is a cost-effective telephone ideal for open areas, including lobbies, classrooms and dorm rooms. The 115 IP Telephone has six feature keys for common operations, a one-line display for caller ID, date and time, and a speakerphone for two-way hands-free communication. 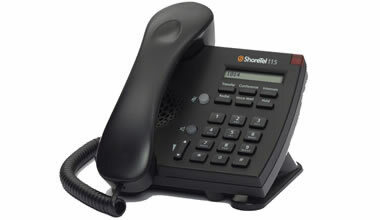 Like all ShoreTel IP phones, the IP 115 features an integrated Ethernet switch, allowing a network drop to be shared with a desktop PC.